Positive outlook should last through 2012 with emerging nations posting strongest gains. The global economy clearly has emerged from the deepest recession since the Great Depression and a recovery has evolved into expansion in much of world, especially in developing countries. For the United States, however, a boost from inventory restocking has played out and underlying demand remains weak. The housing sector, which precipitated the downturn, continues to struggle as foreclosures mount and high unemployment persists. The slow U.S. economic growth to date hasn't generated jobs for most of the 8 million put out of work since the beginning of the recession in December 2007. Gross domestic product (GDP) remains below its past peak and should increase at a subdued pace compared to rates typical at this point in a recovery. Consumer spending, traditionally an engine of growth, should rise slowly as payroll growth lingers and consumer behavior remains cautious. Business investment should be a driver. The recovery is fragile; multiple risks remain and the wrong trade, tax and other policy initiatives could derail activity. Figure 1. GDP continues to rebound, led particularly by increases in countries such as China and India. With the exception of building and construction, most major end-use markets for chemicals have recovered — some quite strongly. The manufacturing sector, which is the largest consumer of chemicals, rebounded robustly during the 1st half of 2010 but growth has slowed following the end of the inventory rebuild. This sector remains well below its past peak. With consumers still cautious and incomes constrained by unemployment, retail sales have softened, though; production of durable consumer goods, e.g., appliances and furniture, has moderated. Light vehicle production, which fell sharply during the recession, has come back strongly and continues to expand — vehicle sales should rise in 2011 and 2012. Housing markets, however, still need additional time to fully repair and recovery isn't expected until 2012. The worldwide recovery continues to advance, especially in developing countries. Global trade has rebounded sharply from the steep drop in 2009 and should expand significantly in 2011 and 2012 (Figure 1). In the developed countries consumer and government austerity constrain growth; demographic factors also pose obstacles to long-term economic growth there. Growth in emerging markets, however, continues robust and will underpin economic developments during the next 10 years. Fears of sovereign debt crises and asset bubbles have dampened expectations. Figure 2. Production volumes now have surpassed their previous peak in late 2009. During 2010, trends in the global business of chemistry paralleled those in broader industry. Overall activity in the $3.43-trillion worldwide chemicals sector improved about 9% in 2010 as the global economic recovery extended into its second year. After a trough was reached in March 2009, a sharp V-shaped recovery ensued. This was particularly the case in China and elsewhere in East Asia. Virtually every nation and region now has experienced recovery. Demand upswings continued in North America, Europe and Japan while emerging markets sustained strong momentum. At the global level, production volumes exceeded their previous peak in 4th quarter 2009, and the recovery evolved into an expansion (Figure 2). Most leading indicators of global industrial production suggest further recovery albeit at a diminished pace. As the worldwide expansion continues, global output should rise by more than 5% in both 2011 and 2012. During the next two years the most rapid growth should occur in the developing nations of Asia-Pacific, Africa and the Middle East, emerging Europe and Latin America (Figure 3) — most notably China, India and Brazil. Korea, Singapore and Taiwan also should present good prospects through 2012. Growth in the chemical industries of emerging nations should exceed 12% in 2010, with average gains of about 8% in 2011 and 2012. In contrast, after the cyclical rebound of 2010, the chemical industries of developed nations should average only 3% growth during 2011–2012 due to headwinds from rising production capabilities in emerging markets in addition to anemic growth in domestic demand. Among the developed nations, the United States should benefit from low natural gas prices. Ireland also should achieve stronger growth than most other developed nations. Other developed countries face more-muted prospects, although Germany and a number of other large exporting nations currently are experiencing strong gains. Figure 3. Emerging markets not surprisingly will continue to pace the production buildup. For the chemical industry in the United States, the steep and sudden drop in spending caused massive inventory imbalances going into 2009. Demand for many chemistry-intensive items (light vehicles, construction goods, appliances, furniture, carpeting, etc.) plunged. As a result, inventories surged throughout the supply chain. Much of 2009 was spent working these inventories down. As a result, chemical production was weak as were shipments and most other indicators of industry activity. A recovery emerged in mid-2009, fueled by stronger export demand bolstered by an improved competitive position with regard to feedstock costs. The upswing continued into 2010, boosted initially by restocking among downstream customers. After the 1st quarter, though, domestic demand slowed and in some markets even declined, thus increasing the importance of export markets. Indicators of industry activity all went up during 2010. Production of chemicals excluding pharmaceuticals should rise 5.2% in 2010. Basic chemicals — inorganic chemicals, petrochemicals, plastic resins, synthetic rubber and man-made fibers — were hardest hit in the recession, having suffered sharp falls in demand from important customer markets such as light vehicles and housing. This segment, however, reached a trough first and has experienced the strongest cyclical recovery. Downstream customers remain cautious about building inventories but have largely depleted their stocks; improvements in final demand will necessitate replenishing once caution is overcome. Many downstream customers still face credit and liquidity issues. As is typical in cyclical rebounds, adhesives, coatings and other specialties should lag basic chemicals, experiencing a more-nominal gain initially but stronger ones in 2011 and 2012 (Figure 4). Leading indicators of manufacturing activity are pointing to slowing demand. U.S. chemical industry growth should rise 3.0% in 2011, buoyed particularly by pharmaceuticals; excluding pharmaceuticals the chemical industry will experience a 2.7% gain in 2011. Nonetheless, the gains should be broad-based and more sustainable growth is likely. Figure 4. As is usual, basic chemicals rebounded more strongly initially but specialties should pick up. The strong projected 2010 year-on-year growth rates for most segments must be viewed in the context of the exceptionally sharp declines seen in 2008 and continuing into 2009. It may take years for activity to recover from these steep drops to reach past peaks. The industry is sensitive to a number of risks, most particularly high and volatile energy costs. A double-dip in the U.S. economy and industrial activity would dampen domestic demand further while a weak world economy would adversely affect exports. Another downside risk might arise if significant output from new capacity in the Middle East and East Asia finds its way into traditional U.S. export markets and even North America. With a slow recovery of volumes, overall operating rates rose to an average of 74% in 2010 — see CP's Economic Snapshot. Further modest gains in chemical industry production volumes suggest slowly improving operating rates in 2011. Further capacity reduction coupled with strengthening production volumes could boost capacity utilization to 79% by 2012. This implies the industry is operating far below its optimal capacity utilization levels. 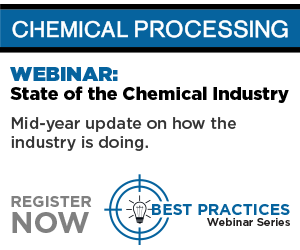 Narrowing margins, austere market conditions, lower operating rates and a high level of uncertainty spurred the stringing out or delaying of a number of chemical industry projects in recent years. Furthermore, companies slashed capital spending budgets to conserve cash flow. As a result, U.S. capital investment in chemistry fell by more than 9.2% to $25.3 billion in 2009. This followed a 9.3% drop in 2008 from a peak level in 2007. Despite a recovery, lingering uncertainty concerning future demand combined with lower-than-average operating rates hindered investment again in 2010, with capital spending falling 1.0% to $25.1 billion. Capital spending cycles generally lag cycles of industry activity with profits and operating rates leading determinants of investment. In general, improving production and utilization rates, cost containment from earlier cost-reduction efforts, modest increases in raw material costs and higher gains in selling prices have resulted in a strong recovery of profits during 2010. In addition, utilization rates have improved, although they still don't match the levels of several years ago and are below the long-term average. Figure 5. A large portion of investments will go for replacing worn-out assets rather than adding new capacity. Other factors influencing the level of capital spending include the business cycle, long-term business expectations, taxation policies, the cost of capital, the burden of debt, the supply of credit and mandated expenditures. The business cycle was in a repressed stage in 2009 and a muted recovery occurred in 2010. Lingering credit tightness, companies' debt reduction efforts to repair their balance sheets, and uncertainty over taxation and other policies as well as long-term demand are hindering capital spending. On the other hand, low interest rates make for a low cost of capital. The stage is set for improving operating rates and profit margins. This, in turn, could lead to moderate increases in investment in new plant and equipment in the United States. The need to replace existing assets is apparent and will be a driver. By 2011 the industry investment cycle should re-engage, with U.S. spending rising more than 6% and accelerating to a 9% gain in 2012. Capital spending should reach $29.2 billion in 2012 (Figure 5), which still falls short of the most recent peak. The largest proportion should continue to go toward replacement of worn out assets. The majority of the expansion of production capacity should target existing product ranges and largely be incremental. As the recovery strengthens into an expansion, spending should rise in future years. With improving competitiveness resulting from developments in shale gas, the United States may once again become a favorable location for investment. Chemicals output now is on the upswing, especially in developing countries. Worldwide production should increase moderately in 2011 and 2012. The U.S. chemical industry should share in these gains and should boost its capital spending, with much of the investment aimed at replacing aging plant and equipment. However, the prospects of abundant and cheap natural gas ultimately may make the United States again a location of choice for new capacity. The number of openings is rebounding in both the U.S. and Western Europe.